Rafael, Iraida and Caitlin! Congrats, and thanks for entering. Your awesome prizes will be on their way to your mailbox shortly. Enjoy, and thanks again for checking us out at TV Screener.com! 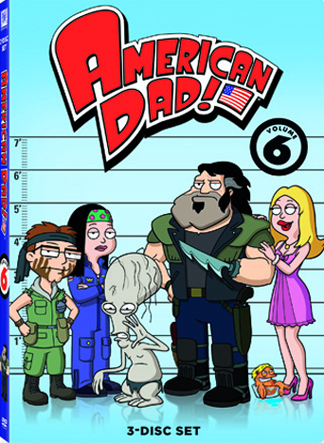 Giveaway time again, and, thanks to our good friends at Fox Home Entertainment, TVScreener.com has three copies of the new American Dad! Volume 6 DVD box set to give away to our lucky readers! SUBJECT: The Wanted Extraterrestrial Known as Roger Has Been Captured! SUMMARY: Agents from Twentieth Century Fox Home Entertainment closed in on the elusive extraterrestrial named Roger*. He was found residing at the home of CIA agent Stan Smith, star of the animated comedy American Dad!. Imagine our surprise! Smith has been harboring Roger in Langley Falls, VA where he lives with his not-so-smart wife Francine, his liberal hippie daughter Hayley, geeky yet cocky son Steve and a unique talking goldfish named Klaus. Video surveillance of Roger and the entire Smith clan will be released in April on the American Dad! Volume 6 DVD. American Dad! Volume 6 includes all eighteen hilarious episodes of season 5, uncensored and loaded with extras, including deleted scenes and audio commentary. Volume 6 is available on DVD on April 19. *Please use caution with Roger as he is a known master of disguise and has recently been seen impersonating a jockey, a police officer and even the leader of a small island nation. – The winner will be announced on the evening of May 9, as an update to this post- For this content, U.S. residents only, please. Although it doesn’t premiere for another two days, South Park’s my favorite comedy on right now. i dont much about tv these days, i stumble onto shows once in a blue moon that i can actually get into and follow. definatly would like and need some happier shows with feel good intentions and comedic worthiness to applaude! i would also like to see some action with greatspecial effects come to tv that whixh is like in the movies, is that in a tv budget? My favorite comedy right now is Cougar Town with Courtney Cox. I gotta tell ya, my favorite TV comedy is “Community”. Soooo many tv shows im into, but how about a action comedy, Chuck on NBC has to be 1 of the coolest, geekiest, hot actor, action filled, adventure laced, dramatic, beautiful women filled comedies around. If your not sure im tellin the truth you should check it out this monday at 8pm on NBC. And help the loyal fans save the show from cancelation one more time. I really dig this show. I just LOVE Modern Family!!! Although not many people like it but I enjoy watching Raising Hope.